This slightly murky meme popped for me in one of my feeds recently, and not for the reason that it was meant to. 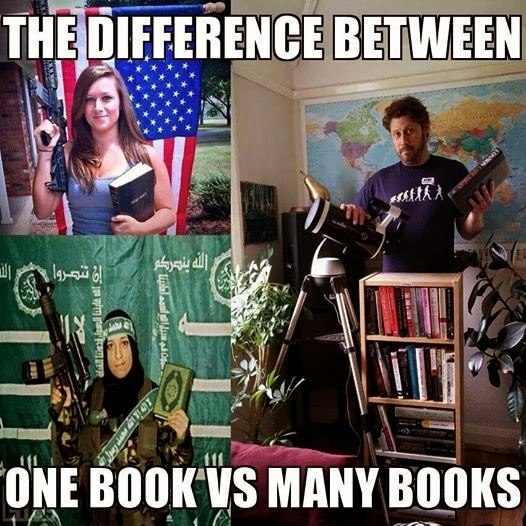 I'd seen the comparison of the US Army wife (gun, flag, bible) and the jihadist (gun, flag, Quran) all over the place, so that it'd be repurposed for something like this is not surprising. Memes beget memes, after all. What this one was meant to be, I think, is a condemnation of people of faith and their "one books." Reading many books, or so the visual implies, makes you more likely to have a telescope. Or something. It's not exactly the clearest meme semiotically. Ah well. There is, of course, another minor problem with this one, one that goes beyond the whole "correlation/causation" thing of which one would presume science-friendly folk are aware. The man on the right, standing there like a book-cabinet centaur, he has...hmmm...let's count them. Onetwothreefour...hmmm. He's obscured some of his collection, but it looks like between 38 and 40 books, if you include the one book he's holding in his hand. They're mostly textbooks, by the look of them. The jihadist is presumably holding a copy of the Quran in the hand that is not carrying the gun. That is correctly described as one book. It is the writing of a single author, divided thematically into chapters, written over several years for a single purpose. The soldier's wife is holding a Bible in her non-gun hand. We get that word, "Bible," from the Greek words τὰ βιβλία. "Ta Biblia," if you know a wee bit o' Greek, means "The Books." It's plural, because the Bible isn't a book. It's a collection of books. That is what the word means. Oh, sure, it tends to be all together in between one cover, but that means what, precisely? One could do that with almost any literature. What the Bible is, frankly, is such a wildly different array of literatures that to consider it inherently "one book" is insane. Isaiah is not a chapter of that book, nor is Ecclesiastes or Job. They were--and really, still are--independent and free-standing units. They are, themselves, books. Here, you have a remarkably varied ancient collection, sixty-six books in all. They were written by dozens of different authors across thousands of years, in two very different languages. They play out across cultures, representing both urban and rural views of life and meaning. They represent poetry, history, wisdom teachings, and music. They have--read on their own and objectively, outside of the blurred and idolatrous lens of fundamentalism--a wild array of different perspectives, styles, tones, and emphases. And so, if you know the reality of the Bible, this is a slightly silly meme. I am assuming, of course, that it is not a very subtle allusion to the necessity of historical-critical method in examining the texts of the Christian canon. It's just trying to make a point, and doing so clumsily and inaccurately. Especially given that the issue here isn't the books. It's not the books at all. It's the (Flags + guns) < (Telescopes + Maps) equation. That's where the issue lies. That's always been the issue.